Food Grade vs. Food Safe: What's The Difference? Takeaway: Think you know the difference between food-grade and food-safe terminology? Think again! The answer isn't very clear. In horticulture, and life in general, the terms food grade and 'food safe' come up often, but finding a conveniently worded or easily understood definition for either or both is a difficult task. The reason is because these two terms are often used interchangeably and the standards governing them differ from country to country. There are numerous federal guidelines outlining what materials can and cannot be used for food storage, but there does not seem to be one overarching, digestible standard. The best way to make sense of the terms food safe and food grade, in order to know which types of containers can be used for gardening applications, is probably to take a look at what aspects are standardized. Knowing how to read the symbols and codes that are often stamped on the containers themselves will help to inform you whether or not the container you are planning to use for your container gardening, your irrigation stations, your nutrient reservoir, or as some other part of a hydroponic system, for example, will be safe to use. In order for any container to be considered suitable for coming into contact with food, thereby deeming it to be either food grade or food safe, it must not be made of any material found to be unsafe by the proper governing authorities (i.e. the FDA in the United States or the Marketed Health Products Directorate in Canada, etc.). This sounds logical enough, but of course there is more to it. No container meant to come in contact with food can contain any dyes or recycled plastic known to be harmful to humans. No harmful chemicals can be used in the raw materials of the container; likewise no harmful chemicals can be used in its production. In general, containers marketed as being food safe or “food grade” are generally meant to be suitable for the long-term storage of food. This means that they are not manufactured with any substance that will break down or leach into the food being stored. Containers that are manufactured to be suitable for long-term storage of food, or items like nutrients that are used to grow food, are generally marketed as being “food grade” and this wording is often highlighted either the container itself or its packaging. Due to the increased costs of manufacturing containers suitable for food storage, not all plastic containers are created equal. It's important to not dismiss these labels as simple marketing tactics. Without getting caught up in the semantics of food safety, a gardener can determine the relative safety of reusing a container based upon the number or symbol that is usually found on the bottom of the container. 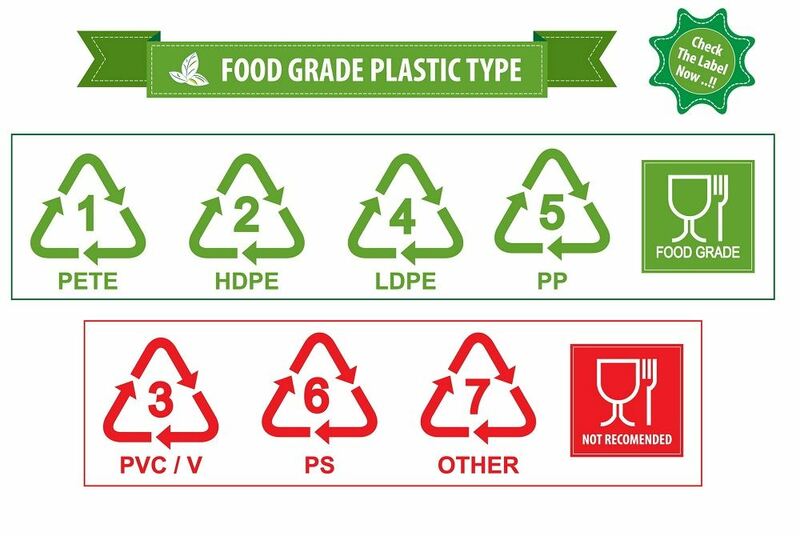 Some numbers of plastics are deemed safe for short-term contact with food, but not meant to be re-used; these, among others should be avoided. 1- Plastics marked with this number are made of polyethylene terephthalate or PET/PETE. These are not known to leach any chemicals or be harmful to human health, making them suitable for re-use in a garden or food production application. 2- These plastics are HDPE, also known as high-density polyethylene. These are considered the top choice of containers for reuse in either a garden or food application. These are not known for leaching any chemicals and are usually more durable than the number 1s. 3- PVC plastics or poly vinyl chloride. These should never be used for any food application or for anything that will come into contact with food. Chemicals used to make these plastics can leach out and are thought to be cancer-causing. 4- Similar to number 2s, these are low density polyethylene (LDPE). They are not thought to contain anything harmful and will not leach out chemicals. These can be used but are not as common as number 4s. 5- These are plastics made of polypropylene (PP). This is a judgment call on whether or not to reuse or incorporate into your garden system. Hazardous materials are used to create this type of plastic, but they do not leach out. 6- PS or polystyrenes are made of known carcinogens. Like number 3s these should not be used in any garden system. 7- Plastics with this number fall into the “other” category, but are usually made of polycarbonates (PC) and often bio-plastics made of some materials like corn. This is a case where the initial use of the container is considered food safe, but over time chemicals leach out making their reuse ill advised. Additionally, the universal symbol of a wine glass and a fork on a container indicate that it is safe for food to come in contact with it and is suitable for reuse in a food production system such as hydroponics. The conversation around food-safe and food-grade gets further complicated when considering the fact that a food-grade storage container might not be food-safe if it becomes microwaved or is filled with boiling water. In other words, the way the tools and equipment are used can alter their degree of safety. Likewise, the term food-grade can refer to a substance – not just a storage container – that is OK to come into contact with items humans will later ingest. The best example of this in the horticulture world is diatomaceous earth, in which there are both food-grade versions and industrial-grade versions – the difference largely being in how fine of a particle size the item is processed and sold as. Food-grade DE can be eaten, or used as a way to organically deter pests from the garden. However, industrial-grade DE is largely used in filtration systems and the like. At the end of the day, in the modern gardening industry, selecting materials that are food-safe may be just as important as selecting materials that are food-grade. What are the advantages of using a fertilizer flush on my plants before harvest?